iPhone 5 With 4-inch Display May Look Like This.. Earlier today, we published a report about some of the details of iPhone 5 leaked straight from the component suppliers of iPhone. Surprisingly, based on the report, the Apple’s new iPhone will feature a 4-inch display which will help Apple compete in display size with the counterpart Android sets. 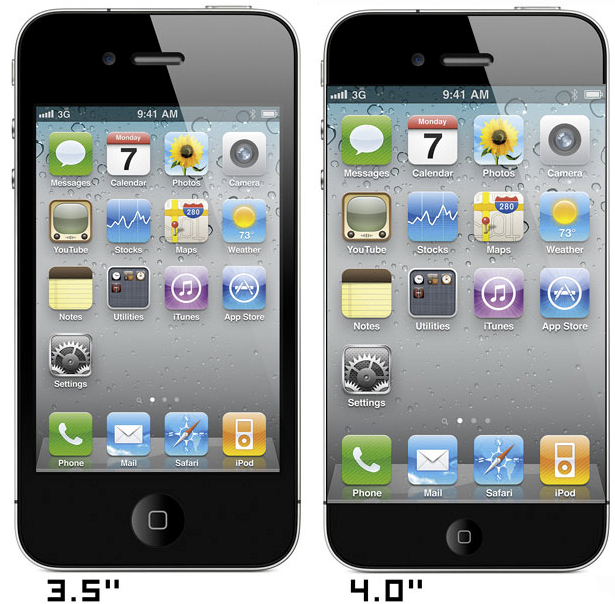 However, inclusion of 4-inch display could be a harder decision than it sounds for both, Apple and the customers. Will the display fit in the current encasement? If not, would you want to buy a bigger iPhone? Our friends at 9to5Mac have drafted a mock-up of how Apple’s new iPhone would look like with a 4-inch display in same encasement. To me, this sure looks ugly as hell or may be that’s just because it’s a mock-up. If Apple’s recent announcement of $4B investment is in display technology to get it to the edge like that, it sure looks an ugly investment to me. If not, Apple will require bigger encasement for iPhone 5, which is how it’s more likely to be, in my opinion.